Place the heel of one hand in the centre of the casualty's chest and the heel of the other on top. Interlock your fingers. Press down on the sternum, 5 to 6 cms (2 to 2.5 inches), 30 times. After each compression release the pressure but don't remove your hands. Pinch their nose closed, breathe in, cover their mouth with yours and breathe steadily into their mouth. 2 rescue breaths should only take 5 seconds. Make sure their chest rises and falls. Currently only 10% of people survive a community cardiac arrest. This is frequently because early resuscitation is not started. Early CPR will increase the chance of survival to 50%. Each minute without CPR means that a further 10% of people will die and 10 minutes without heart output or any resuscitation is almost always fatal. 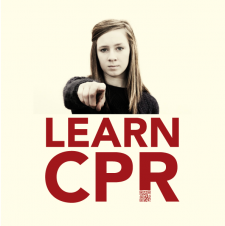 There are many courses around to help you learn CPR. Nationally these courses are provided through such organisations as the St Johns Ambulance Service and the British Heart Foundation. Within Leicestershire (and Rutland) we have created a collaborative group to provide CPR training to all secondary schools, and can provide hands-on training to sports facilities and some businesses.